Little Anthony wasn't satisfied with the tuning of our guitars and retuned all of them the other day. With just a bit more than 2 years in this world, he didn't conform with our self-set musical standards. A good time to think about tuning (once again) and see where it may lead us. Mathematically the base of 440 Herz in 7-stage tonal system is a bit strange, quite chaotic, some say. But what else is out there? In any case, hearing is believing but unfortunately not a lot of music exists (yet) that is based on this tuning and some that do exist have some errors, like some videos on youtube.com that promote the concept as a meditation tool. We identify the Ifa prime energy (Odu) for 528 as Otura and immediate recognize the next nodes as a clockwise progression as a wheel within the fourfold wheels of the Toth diagram: Otura, Irete, Ogbe, and Oyeku. We can chip in the remaining Odus even without a description of Solfeggio fans as Oturupon (963 Hz) and Ika (285 Hz). For the latter 'quantum consciousness' is an odd description as in Ifa it is the sacred energy of birth (and death). Back to the harmonic triangles: the missing corner of the first triangle must have a frequency of 174 or 1074 since all frequencies of the Solfeggio scale are 111 Hertz apart. Note that the sum of individual numbers needed to maintain the phenomenon of equal sums is PRESERVED either way: 1+7+4=1+0+7+4=12 (the other triangles add up to 15 and 18 respectively). This is a very interesting property of the sums of 111. The ninth energy node (Olodu), we could speculate, could be on the OUTER wheel of the Toth Diagram. Ofun-Irete-Oturupon are all describing spiritual qualities, and Ika, Otura, Oyeku are on the emotional and basic life side, the side of what I came to call the 'soul side'. 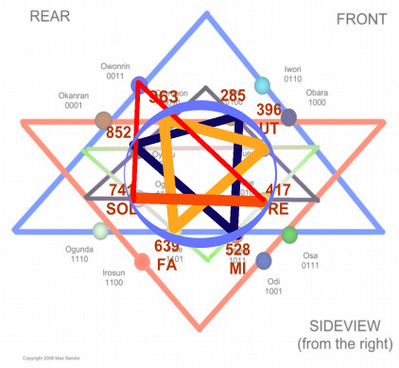 The triangles are composed of two Odu nodes of a basic wheel in sequence PLUS one Odu node of the 'super wheel of manifestation', Ogbe, Oyeku, Ofun, and Oshe. Obviously, (2.) results from (1.) by adding a binary '1' and (3.) from (2.) by adding 2 (binary '10'). Therefore, if the internal math would be consistent, the missing Odu node would have the binary code of 0100 minus 1 and that would be 0011 which is Owonrin, the upper left node on the Toth diagram. Owonrin is characterized as 'form' in contrast to 'essence' (irosun), slow or frozen flow in contrast to energy bolts, mental images in contrast to 'movies', giving permanent shape to things. The frequency (174 or 1074?) would result in moods of creative contemplation, imaginery, phantasy, but easily also slowing down energies, in this sense relaxing. Owonrin, in 'classic Ifa' is the bridge between 'will' and 'physical manifestion'. As a temporary final note, the 'sound of creation', as a chord, would be 'Owonrin-Ogbe-Oshe', (174,417,741 Hertz), and whoever knows Ifa good enough, knows the above combination very, very well. The Universe is a woman, one might conclude from the above, if it wouldn't already be clear enough. The 'sound of silence' (oyeku) together with the 'sound of the heart' (otura) results in life (Ika, which, as a name, also contains the root of literally 'heart'): 285, 528, 825 Hz. Finally, the great harmony of the spirit would be the wisdom of Ofun, the relations within the world (Irete), and the ethics and sovereignty of the spirit (Oturupon) as 396, 693, and 963 Hz. PS: Aug 6th: I corrected the binary writings of the odu since I goofed. And found that the math is not as clear for the first column. It is still Owonrin (as I happen to know through other sources) but one doesn't arrive there by simply subtracting 1. I left it there because it is still fascinating. I also made the graph a bit clearer since several people wrote me that they couldn't see the basic loop. You can look at the Toth diagram description earlier in this BLOG to verify the sequence. In itself it is quite amazing, lending credibility to BOTH the Toth Diagram and the Solfeggio Sound Theory. Also, dear reader, check out the sound files Mortimer made (see the 'comments'). 1. 174(F3) 417(G#4) 741(F#5) tonic? 2. 285(C#4) 528(C5) 852(G#5) supertonic? 3. 396(G4) 639(D#5) 963(B5) mediant? 6 Aug 2009 @ 19:12 by mx @189.46.181.150 : strange coincidence(s9...? I found a blip of my recordings from 1989, yes eighty-nine.. on a Monroe-type project... only a blip.. maybe GZ has still one of the tapes I produced.. or the original 1/4 reels.. (2 of them)... some of the sounds ARE of those frequencies.. I'll be darn.. if I'd only known back then... but maybe I'm here where I am because of hearing my own strange sounds... made the cats go asleep, remember GZ? check out diapason on wikipedia.. has links to the other methods, too, but not the 111 Hz (or I didn't see it)..
are you an ancient one? .. oh oh..
found a website with a Java applet to hear the sounds talked about in the article above and some more.. it is a single page with no reference to its creator or other purposes... except an embedded video with Scn propaganda... strange..
WHAT scale does mosc pitch follow closest??? DO you know,Max? I din't see any references about scales when looking up mosc pitches... btw WHO came up with this Solfeggio Scale and why and where? Is it commonly used in MUSIC in any country/culture? 19 Feb 2011 @ 23:00 by mx @201.92.190.101 : a tune based on the chords shown here.. The nine frequencies you listed are a generative subgroup of the 72-member set I have (re)discovered and documented elsewhere as "Preston Toroidal Scale". Every member is composite and divisible by three. The sequence is symmetric and centered at 555=(123+987)/2 etc. 4 Feb 2012 @ 17:41 by mx @201.92.193.188 : very cool, Doug! Toroidal usually resome connection with afers to a 3-dimensional Torus. Is Preston Toroidal Scale someway related to the Torus? Other articles tagged as "toth diagram"